Are we already halfway through January 2015?! Wow, the holidays were that long ago? I hope you, dear reader, had a wonderful and warm holiday season with those you love. As for what I was up to over the holidays… I had the pleasure of spending a few weeks in Asia (one of which was at a warm tropical destination where I drank out of coconuts pretty much everyday). During my stay in Shanghai, I made it a point to spend some time back at the old studio. It was great to catch up with friends, to see how things have changed or stayed the same. Being rather ambitious, I even managed to squeeze in a couple of clay sessions into my visits. For some reason, I just really wanted to get my hands on that yummy dark chocolate Yixing clay again. Of course, I couldn’t get much done within the time constraints; but in the end it was fun to get my hands dirty. 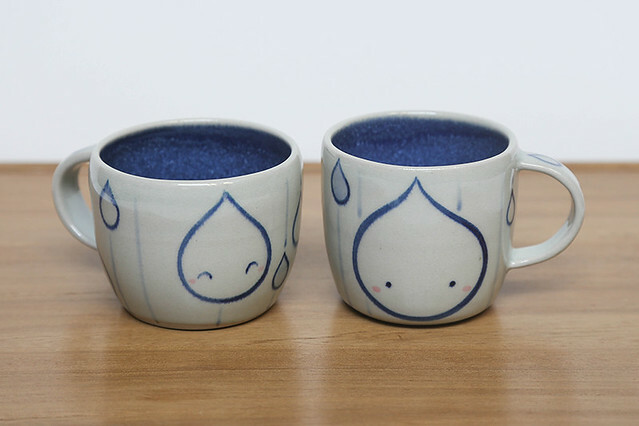 As mentioned in a previous post, the raindrop motif has been a recurrent one for me. 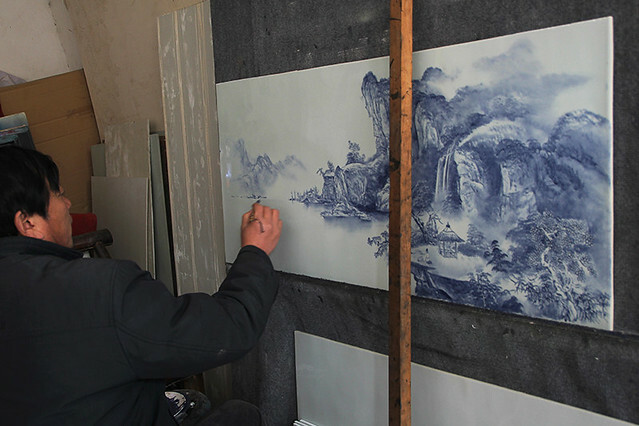 When I first began using it in my cobalt blue hand painting a couple of years ago, it was in part to help me cope with my impending move to Seattle after spending a couple years abroad in China. 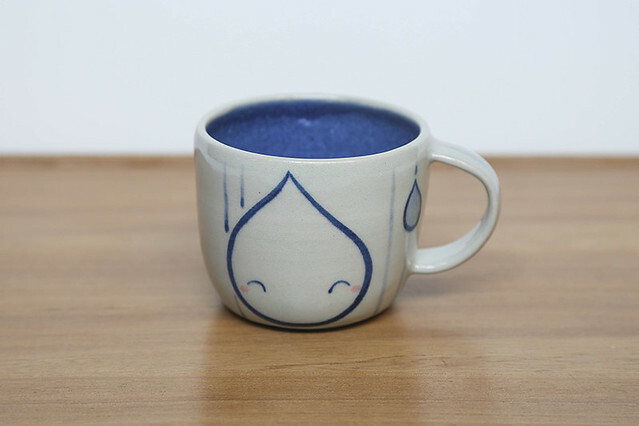 I have since continued to use it because I just think they’re a lot of fun to paint (not to mention I love each little raindrop character : ). 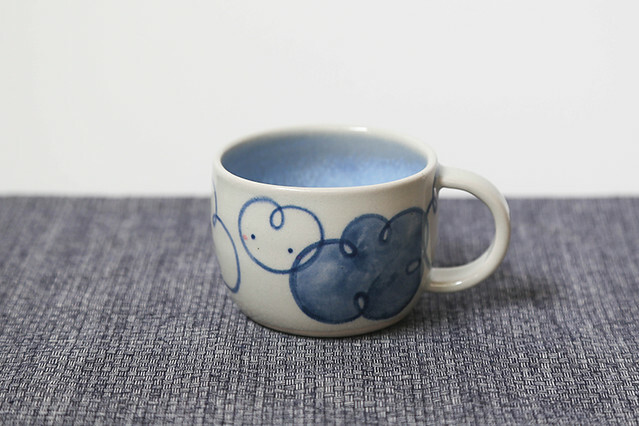 Recently I’ve been playing with different glaze colors and have even started experimenting with clouds as a related motif. So far, I’m liking what I see! 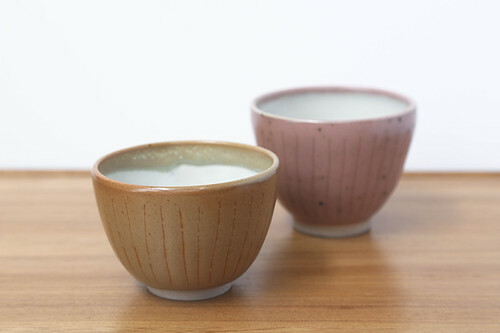 I think I’ll be making more of these… and I have the entire rainy season ahead of me to keep me at work indoors. 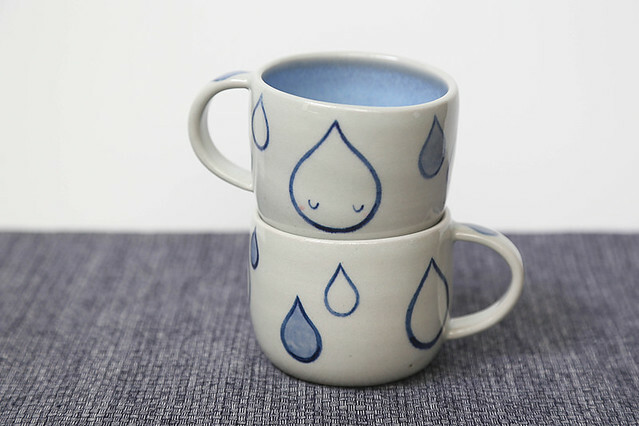 But really, I actually love hearing the pitter patter of rain outside, provided I’m warm and dry inside… and can cozy up with a mug of something steaming hot (perfect in one of these little mugs, don’t you think?). Here’s a sneak peak of what’s in store for the Etsy shop in August. Say “hello” to the Speech Bubbles collection! Up until now, this collection of work has not made it on to the interwebs, though a couple have made appearances on Instagram here and there. 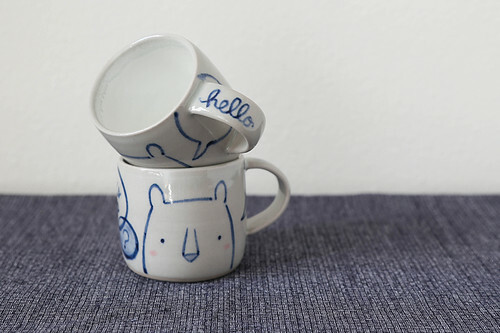 The hand painted pieces mainly feature a few fun and friendly bears and bunnies having conversations with each other… and with you. Occasionally, the drink contained within the vessel might even pipe up with a word or two. These guys will be popping up in the Etsy shop over the next two weeks! The final countdown. I will be a featured artist this weekend at Panorama, hosted by RAW:natural born artists. I hadn’t heard of the organization until I was approached a few months ago, but they currently operate in almost 60 cities across the US, Canada, Australia, and now, the UK and Japan. They bring local independent artists of various genres under the same roof to provide them with tools, resources and exposure. Yeah, sounds pretty awesome. 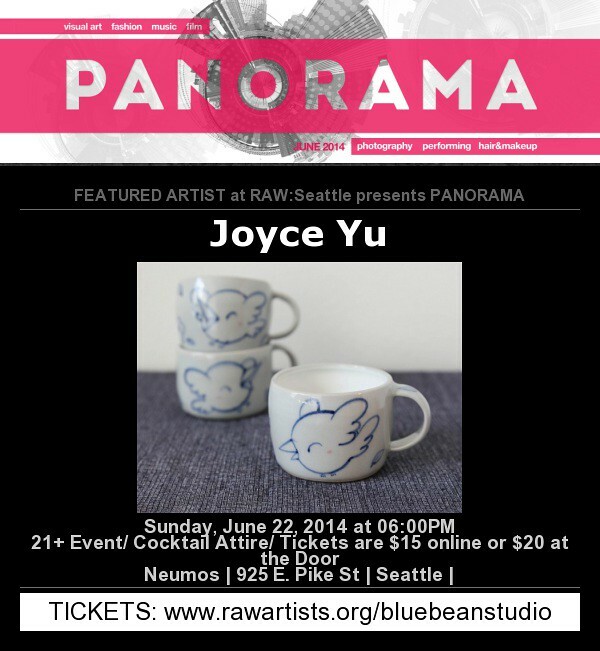 Panorama will take place at Neumos in Capitol Hill this Sunday, June 22nd (6pm) and will feature visual arts, music and other performance arts, in addition to fashion design. Looking forward to meeting the other artists and sharing my work. 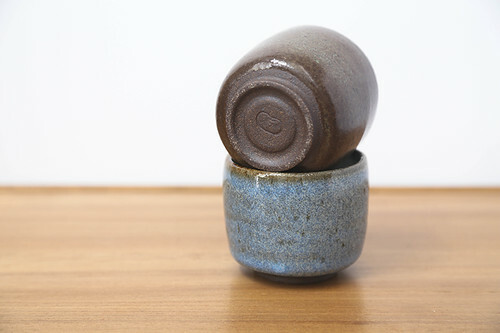 I believe blue bean studio will be the only ceramic arts there — represent! 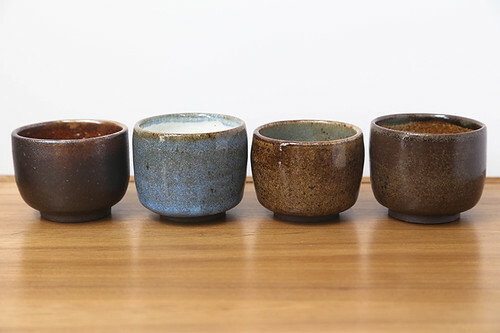 After my last batch of mugs for the Kirkland Artist Studio Tour came out of the kiln, I realized I was going to have some trouble parting with a few of them. Since I spend quite a bit of time painting every character on each of my pots, I often get attached to them… kinda like they were my pets. It can get pretty difficult to see them go, which would explain the ever-increasing collection in my cupboard. The problem is, our tiny apartment cannot support any more of these little guys, so I do have to send them off to new loving homes (and hopefully a few lucky ones will meet their new owners this weekend). While I’m not quite at the point of separation anxiety, I’m definitely going to miss some of these sweet mugs. My solution? 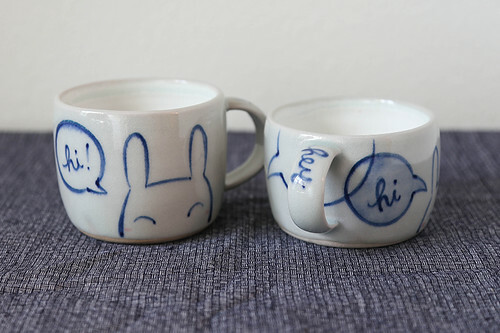 Launch the Mug Adoption Program (henceforth also known as the M.A.P.). More specifically, when someone picks out a mug (or any item with a face on it, for that matter), they can name the piece and write it on an “adoption card” (along with their name and the “adoption” date). 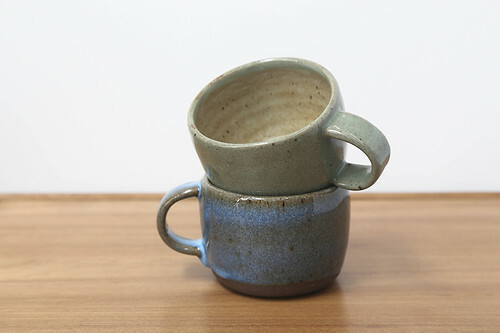 Then they take a photo of the card with the mug and send it to me at bluebeanstudio(at)gmail.com. 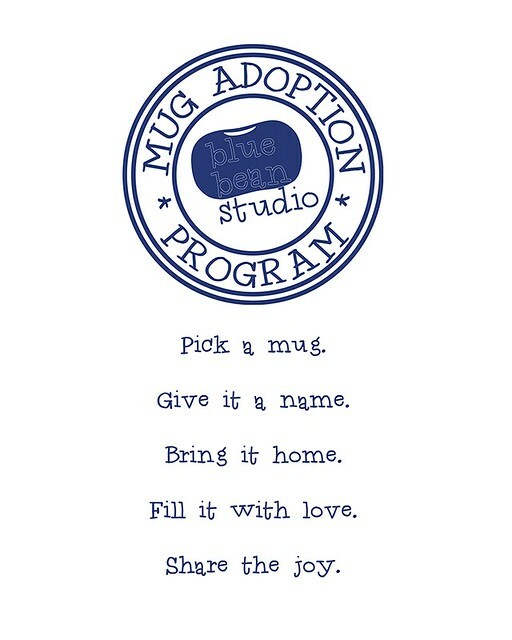 I am hoping to collect enough photos to create a virtual photo wall on the website so that people can see their mugs among the big blue bean studio family. This way, I can have a record of every little creation and perhaps, one day, even keep track of where they are in the world! Before I crossed the threshold from being merely a consumer to a creator, I had always enjoyed seeing the “magic” that happens behind the scenes to see how things are made. Now that I spend much more time with my hands dirty making things, I am even more intrigued by how and where art is created. For me, the act of observing draws me into the realm of the process and connects me to the maker. Perhaps it is my fascination with the transformative process that hooks me in — the layering of colors on to a blank canvas to convey a scene, the melting and shaping of glass to form curvy vessels, the weaving of individual threads to form a detailed tapestry… And of course, being in ceramics, clay in particular never ceases to surprise me with its transformation from wet amorphous blob to functional or sculptural pieces. All this to say… I’ll be on the other side of things this upcoming Mother’s Day weekend. 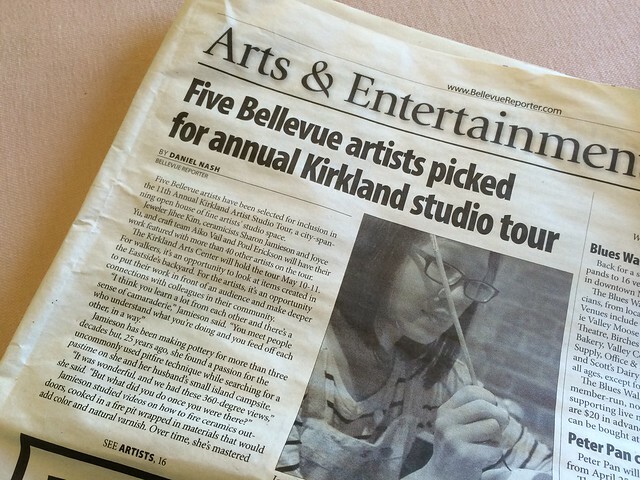 We, along with 19 other studios across the city of Kirkland, are flinging the doors open to invite the public into our space and see what we get up to here in the Resident Ceramic Artist studio. We will be doing some demos in addition to showing and selling our work. While I wish I had some time to explore the other studios myself, I look forward to interacting with visitors and engaging others in the artistic process! Find out more at www.kirklandartiststudiotour.com. The local newspaper says so. It’s in print… so I think that counts! Sometimes I’m hesitant to categorize myself as an artist, especially coming from a health professional background, but I can’t deny that I’m passionate about creating. Now the question is, what makes it art…? I’ll leave that one to the intellectuals debating in lecture halls. For now, I’m happy to keep on creating and doing what I love — whether or not it’s considered art.